Liam's Lament is the third book in the Arrowtown series. Reading the previous book in the series is advised to understand the context of this story. This is a true mates M/M/M story with MPREG. Warnings include graphic intimate scenes, violence, coarse language and love so sweet it will make your teeth ache. 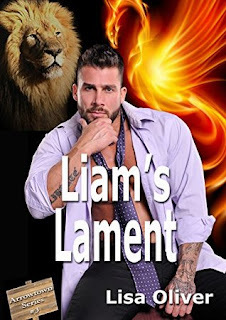 Liam’s Lament by author Lisa Oliver is the third book in Arrow Town series. This book should be read in order. Will help you understand the world much better. This story starts out with a little from Snake Snack so you know how this book ties in with that book. Which is another reason you really need to read these stories in order. Beau : he is a phoenix shifter. They always get two mates. Beau himself is a little naïve about how things work. He thinks that his mates will want to be together no matter what. Liam: he is upset. He doesn’t know he has two mates. Till he meets Beau. But has met the man who thinks he is their third. He is an evil man. And someone who has done great harm to him and his friends. Theodore: corrupt and evil. Mean has no real feelings. What do you do when one of your mates is pure evil? This story is fast paced but truly an emotional read. I liked this one of the best in the Arrow Town series so far. Has lots of depth, a great ending, and unforgettable characters I loved. I cannot wait for more from this great series in the future.